Zombie Apocalypse Eli Machete – Influenced by Book of Eli. Fully Functional. 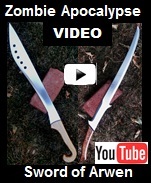 Made by Scorpion Swords & Knives from Quality Heat Treated Steel. See Pictures, Prices, and Descriptions. Handle: White Oak Weight = 3 lbs. The story revolves around Eli, a nomad in a post-apocalyptic world, who is charged with delivering his copy of a book, the very last remaining King James Version of the Bible, to a safe location on the West Coast of the United States. The history of the post-war world is explained along the way as is the importance of Eli's task. Thirty years after an apocalyptic event, Eli (Denzel Washington) travels on foot toward the west coast of the United States. Along the way, he demonstrates uncanny survival and fighting skills.